Astronomers discovered the largest diamond of all times in space. The weight of the precious stone reportedly makes up ten billion trillion trillion carats or five million trillion trillion pounds). The space diamond is virtually an enormous chunk of crystallized carbon, 4,000 kilometers in diameter. The stone is located at a distance of 50 light years from Earth, in the Constellation Centaurus. "You would need a jeweler's loupe the size of the Sun to grade this diamond!" says astronomer Travis Metcalfe (Harvard-Smithsonian Center for Astrophysics), who leads a team of researchers that discovered the giant gem. 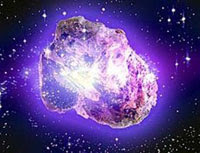 The cosmic stone completely outclasses all diamonds that have ever been found on Earth. The largest diamond weighing 546 carats was found in South African Republic. The diamond, The Star of Africa, resides in the Crown Jewels of England. The Star of Africa was cut from the largest diamond ever found on Earth, a 3,100-carat gem. Lucy, also known as BPM 37093, is actually a crystallized white dwarf. A white dwarf is the hot core of a star, left over after the star uses up its nuclear fuel and dies. It is made mostly of carbon and is coated by a thin layer of hydrogen and helium gases. The white dwarf is not only radiant but also harmonious. It rings like a gigantic gong, undergoing constant pulsations. "By measuring those pulsations, we were able to study the hidden interior of the white dwarf, just like seismograph measurements of earthquakes allow geologists to study the interior of the Earth. We figured out that the carbon interior of this white dwarf has solidified to form the galaxy's largest diamond," says Metcalfe. Astronomers say that our Sun will die in five billion years and become a white dwarf too. About two billion years after it will turn into a similar diamond that will continue to sparkle in the center of the solar system forever.